I thought I’d show you an update on the quilt with too much fullness. This is a view from the angle that showed the fullness at its best. There are a few small tucks in the fabric between the inside and outside borders. I try my best to avoid tucks but sometimes they happen anyway. I was trying to ease in about 2 or 3 inches of extra fullness in this one area. Moving to another angle to show you I’ve now drawn a chalk guideline for me to follow. Hmm… doesn’t look so full from this angle. 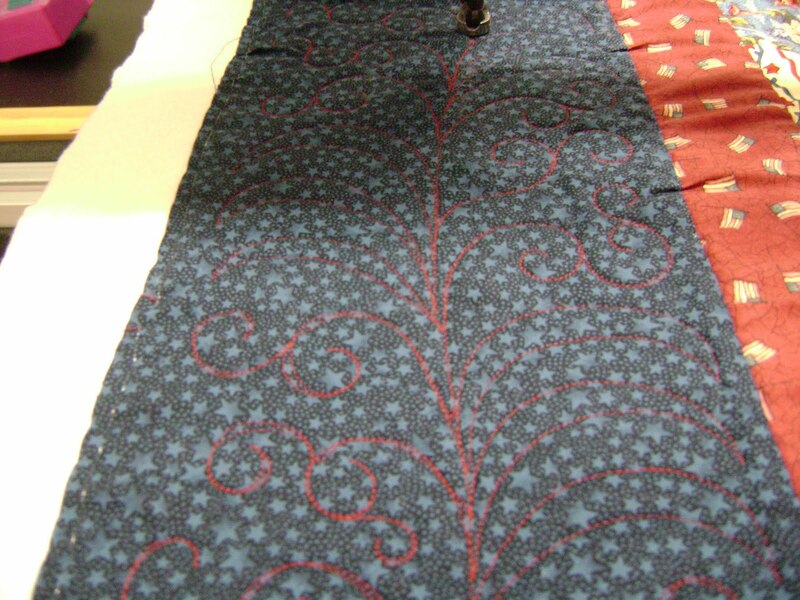 As I quilt the design, I use the fingers of my freehand to ease the fabric in between the stitching lines as I move the machine. I use only designs that don’t cross over themselves. Meeting at the center line is not crossing over itself. As you can see, the fullness is worked in and not as noticeable. It’s still there, just “eased in” between the design lines. 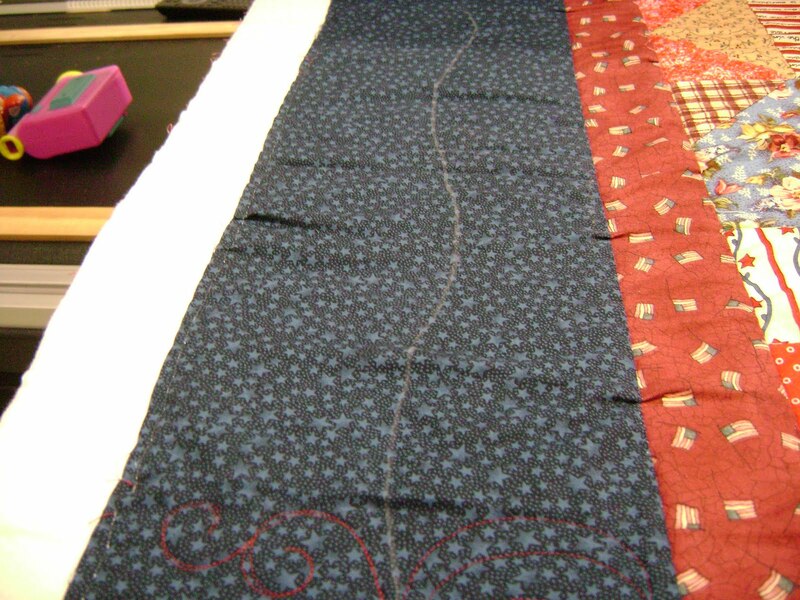 I work one side, then the other side, moving from side to side of the design as I move around the border. The reason I do the border first is because when the quilting is done on the center it draws up which creates more fullness on the border. I don’t want to compound the fullness already in the border. Clear as mud? I’m not sure how to explain it better. Quilting the borders first makes them tight while the center will become saggy. When the center is then quilted it tightens up to be even with the border. 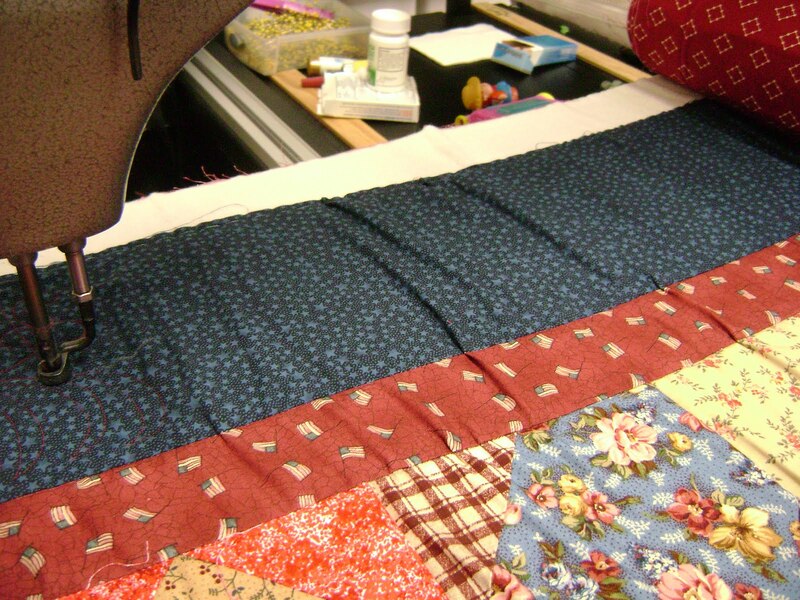 Even the small tucks will be far less noticeable once the whole quilt is finished. Hee, hee, I preach to the choir all the time… but do they listen? That's a GREAT tip…but also a GREAT reminder to DO YOUR BORDERS CORRECTLY! Geesh! I know I'm preaching to the choir, he he he. This entry was posted on February 22, 2010 by Anita in Quilts with issues.